"Surely you can't be serious! I am serious... and don't call me Shirley." This time "we're on a mission from god" and solving 80's classic titles. "It's the devil's work." Well not quite. So "come over here" and "do, or do not. there is no try." Take a walk down memory lane and relive the 80's classics in the game "80's Shoobah". This game will test your memory of famous movies, songs, actors and artists from that decade. Let your fingers do the walking as you scroll three picker wheels to match the those titles under the pressure of a timer. Flick those scrollers fast to match as many titles as you can. So "carpe diem. Seize the day, boys" with 80's Shoobah and "make your lives extraordinary." 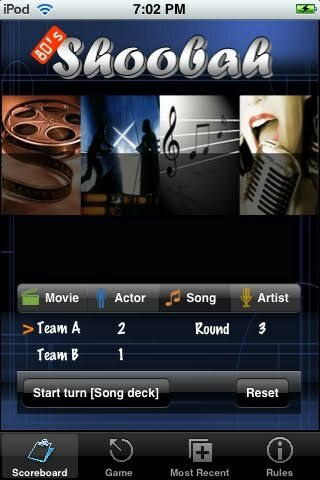 Shoobah is an entertainment trivia game that is similar to "Don't Forget the Lyrics". In "Don't Forget the Lyrics" players need to complete a lyric line. 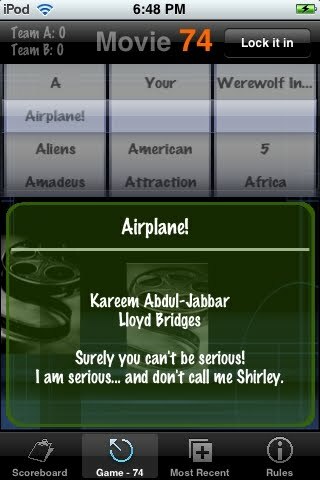 In Shoobah, players need to complete the title phrase. Shoobah has cards with a topic title and other clue phrases listed below. The topics are organized into the categories of Movie, Actor, Song and Artist. Each category has its own deck of cards and they are displayed in different colors. The playing team's goal is to guess the card's title using the clues listed below and the scroll lists provided. The objective of the game is for each team to guess as many card titles as possible. The team with the most points after an agreed number of rounds wins the game. Organize all players into two teams, preferably of equal size, named Team A and Team B. Nominate a player from each team for round 1, round 2 etc. Ensure both teams agree on which deck to use for each round. A player from Team A takes possession of the playing device. Team A player navigates to the Scoreboard page (ie. 1st tab) and selects the category. When all team members are ready, the Team A player touches the "Start turn" button and the shot clock begins. Team A player reads out aloud the category and clue phrases on the card. Team A player may flip the card over at any stage to review the alternate title on the back side of the card. Team A player scrolls the title words to nominate the title phrase while the other Team A members shout out suggestions. When ready, Team A player presses the "Lock it in" button. The title is validated, the score is adjusted, and the next card is drawn. Play continues until the shot clock expires. On completion of Team A player's turn, swap roles with the Team B player and proceed as above until the end of the round. Normally the game continues until every player has played a round. Cards which are guessed correctly are awarded 1 point to the score and 15 seconds added to the shot clock. Cards which are guessed incorrectly incur a 5 second deduction from the shot clock. The Shoobah game is organized into four pages. Pages can be navigated by tapping the tab bar at the bottom of the screen. The first page is the Scoreboard. This page outlines which round number the game is on, whose turn is next and the deck to draw cards from. The scorecard outlines the number of points each team is on. The "reset" button will clear the scorecard. The selected category option will change the draw deck when the next turn starts. The second page is the where the Game is played. The player is automatically navigated to this page when the "Start turn" button is touched. The score summary and shot clock is displayed at the top with the Shoobah card displayed directly below. Shoobah cards are drawn from the nominated deck. Cards can be flipped over to the other side by the swipe finger gesture. Touch the "Lock it in" button when your selected title is ready for validation. The third page displays the Most recent history deck. Cards that are played during the game are transitioned to a history deck. The history deck is limited to 10 cards and is managed in a first-in/first-out basis. Cards that are pushed out of the recent history deck are shuffled back into their original draw deck. Recent cards are added to the top. 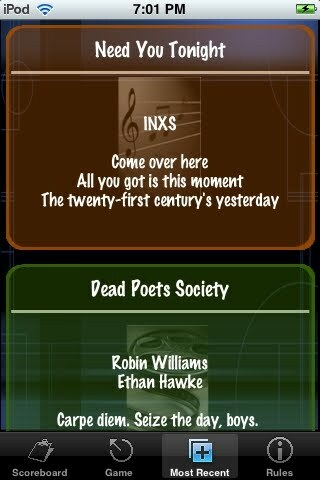 The deck can be viewed by swiping the display up or down. Cards can be flipped by using the swipe finger gesture. The fourth page is the Rules booklet. This page provides an overview of the game introduction, its rules and the user interface. We hope you have fun re-living the 80's, 90's and naught's at parties.